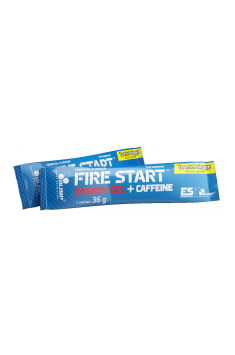 Olimp FireStart Energy Gel + Caffeine is a high-quality energy gel in a quickly absorbed form which allows you to provide a gradual essential source of energy in the form of carbohydrates in adequate amounts necessary for muscle function. A complex of microelements and stimulants ensures proper blood flow in muscle tissue (“pumped feeling”) and better motivation and focus on training. In addition, convenient packaging of the preparation allows you to take it during training. The product has a neutral taste and does not thus cause discomfort. Thiamine, otherwise known as vitamin B1, is a crucial vitamin, especially to intracellular energy production. It prevents the accumulation of lactic acid which is harmful to muscle cells. Its excessive amounts lead to pain and reduce the efficiency of trained muscles. Because of that, training performance decreases. Furthermore, it improves the production of energy accumulated in ATP and thus contributes to more effective workouts due to a considerable increase in strength. Potassium, along with sodium, belongs to important electrolytes with antagonistic effects which act on the muscles. Potassium cations are the main intracellular cations and their proper concentrations are necessary for normal conduction of nerve impulses. As a result, they contribute to healthy functioning of the neuromuscular junction, which is responsible for the initiation of muscle contraction at the molecular level. The heart is a very sensitive organ which responds very rapidly to deficiency in potassium ions. Its normal function is vital especially to athletes because it helps pump enough blood to trained muscles. Too low potassium levels lead to impaired myocardial contractiility and contribute to a decrease in efficiency of a training person. Because of that, it is important to think about supplementation with this electrolyte. Magnesium is another electrolyte which acts on the neuromuscular junction. Its main role consists in the modulation of neurotransmission. This is owing to the “competition” between magnesium and calcium – calcium initiates muscle contraction whereas magnesium reduces or even minimises its effects. It is important especially in the event of excessive abnormal muscle contractions. Magnesium intake helps thus reduce their incidence and restore normal functioning of muscle tissue. Another essential aspect of magnesium for athletes is the presence of its cations in metabolic processes inside the cells because they facilitate the production of metabolic energy utilised, among others, for initiating muscle contractions and allows you to train effectively. Magnesium citrate found in this supplement is characterised by the best absorption on the market and is much more effective than other popular magnesium products. Sodium belongs to main extracellular cations and has an invaluable role in the body. The most crucial task of sodium, along with potassium, is to maintain proper hydration of tissues and thus regulate the body’s water-electrolyte balance. Because of that, adequate levels of sodium cations contributes to a feeling of muscle pump, which is proper blood flow and hydration of muscle tissue. Sodium deficiency results also in abnormalities in neurotransmission in the peripheral and central nervous system. This is manifested by, among others, poor muscle strength or even seizures and disorders of consciousness. Because of that adequate intake of this element, which depends from many factors, is crucial. Taurine belongs to naturally occurring amino acids. Its main role is the presence in detoxification processes in the liver because it is a component of bile acids found in the bile. What is more, it has been shown that this amino acid helps stabilise blood glucose levels and thus prevents drops in energy which are often caused by a rapid fall in plasma glucose concentrations. This provides high motivation and focus before training. Guarana extract is a source of natural, best absorbed caffeine, a methylxanthine which blocks primarily purinergic receptors in the central nervous system, thereby reducing fatigue. As a result, it increases motivation for training. It has been demonstrated that it promotes well-being by boosting dopamine and serotonin levels. Furthermore, it helps burn body fat, namely an additional source of energy utilised by muscle tissue, because it increases extracellular cAMP levels. Consequently, it activates the enzymatic machinery in adipocytes which is responsible for burning fat stored in the cell cytoplasm. To sum up, Olimp FireStart Energy Gel + Caffeine is a formula which suits perfectly the needs even of the most demanding clients who value comfort of use and extra source of energy to recharge their batteries and train more effectively. Take a maximum of 4 sachets daily - should be used during physical activity at regular intervals. No need to use the supplement on non-training days. The supplement is designed for people who lead a stressful lifestyle or do hard workouts and look for a nutritional supplement which will reduce fatigue and also help increase energy levels during strenuous training sessions. I recommend it to every person who expect these results, regardless of dietary goals. Another advantage of the supplement is the content of caffeine which will contribute to an increase in focus and reduction in fatigue. 43% maltodextrin, water, 21% fructose, acidity regulator - citric acid; aromas, preservative - sorbic acid.